Mark was recognised as an outstanding singer at the age of 13 when he was awarded a Music Scholarship to City of London Freemen’s School where he studied singing with Helen Pritchard. He then went on to complete a music degree at Birmingham University, where he studied with Gordon Sandisson and Catherine Benson. He has also studied and taken masterclasses with notable singers such as Simon Keenlyside, Rosalind Plowright, Sir John Tomlinson and Susan Bullock. Mark’s upcoming roles include Le Directeur LES MAMELLES DE TIRÉSIAS, and Joseph de Rocher in the staged UK premiere of Jake Heggie’s DEAD MAN WALKING. Mark’s previous operatic roles include title-role DON GIOVANNI and Marcello LA BOHÈME for Opera Loki; Papageno DIE ZAUBERFLÖTE with Hampstead Garden Opera; Rabotnik THE FIERY ANGEL with Scottish Opera; Jack Point THE YEOMAN OF THE GUARD at the Portsmouth Guildhall; Death SAVITRI at the Royal Conservatoire of Scotland Opera School; Adonis VENUS AND ADONIS at the Barber Institute Summer Festival; Dr Falke DIE FLEDERMAUS for Winterbourne Opera; Koko THE MIKADO with Co-Opera; Dr Pangloss CANDIDE with London Musical Theatre Orchestra; Sir Joseph Porter HMS PINAFORE at the Harwich Festival; The Artist in Puppet Opera Triple Bill – Winner of Off West End Best Opera Award; Il Dottore LA TRAVIATA for Euphonia; Gob in Vaughan Williams’ THE POISONED KISS at the Barber Institute Summer Festival; Morales CARMEN with Riverside Opera; Judge and Counsel TRIAL BY JURY and Wagner FAUST for Winterbourne Opera); and Antoine LA VIE PARISIENNE at the RCM International Opera School. His musical theatre roles include Sky Masterson GUYS AND DOLLS; Ali Hakim OKLAHOMA! ; Pharoah JOSEPH AND HIS TECHNICOLOUR DREAMCOAT; Steward INTO THE WOODS; and chorus and chorus SWEENEY TODD and ME AND MY GIRL. 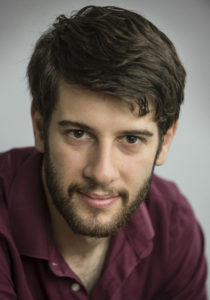 He has also performed in scenes from LE NOZZE DI FIGARO (Figaro and Count), COSI FAN TUTTE (Guglielmo and Don Alfonso), DON PASQUALE (Malatesta), SWEENEY TODD (Sweeney Todd), IPHIGÉNIE EN TAURIDE (Orestes) LES CONTES D’HOFFMANN (Dr Miracle), ELEKTRA (Orest) THE MIKADO (Pooh-Bah), THE PIRATES OF PENZANCE (Major General), THE LIFE TO COME (World Premiere), BETWEEN WORLDS (World Premiere). Mark is in demand as a recitalist and oratorio soloist. His oratorio work has included Bach’s Wachet auf, Ruft uns due Stimme BWV 140, Vaughan Williams’ Dona Nobis Pacem, Fauré’s Requiem, Duruflé Requiem, Howard Goodall’s Eternal Light Requiem, Stanford’s Songs of the Fleet, Coleridge-Taylor’s The Death of Minnehaha, Mozart’s Coronation Mass, Vaughan Williams’ Five Mystical Songs, and Saint-Saëns’s Requiem. Mark is passionate about a capella music. He founded the University of Birmingham A Capella Network, where he sang in three groups and was the musical director for a fourth. One of his groups, The Sons of Pitches, went on to win Gareth Malone’s The Naked Choir. He is also a keen lyricist. His debut musical, RIPTIDE: THE SLASHER MUSICAL, garnered an award from the Musical Theatre Network, after a successful Edinburgh run in 2014. Since, he has written several other musicals. He has also written a collection of children’s poems: Riddle Me This, which has been set to music by Ronald Corp for the New London Children’s Choir. In 2011, Mark was the musical director for the University of Birmingham’s production of THE PAJAMA GAME and in 2012, he was Artistic Director of PAUL BUNYAN to great critical acclaim. Mark plays the cello, piano, bass guitar, acoustic guitar, accordion and the banjo, and plays in chamber ensembles, orchestras and pit bands.